Morris J. Niedenthal Memorial Organ for Augustana Lutheran Church of Hyde Park, Chicago, Illinois. A June 2015 released CD by Rhonda Sider Edgington is available here. Album details and selection notes is available here. Recordings of the 20 April 2012 Inaugural Recital by Rhonda Sider Edgington are available here. Other recordings of a 14 November 2011 Festival Evening Prayer service are available here. 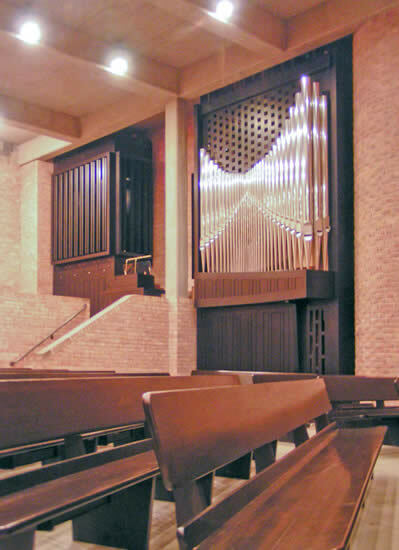 The instrument is placed in the corner of the modern non-rectangular sanctuary, allowing all pipework excellent tonal egress on a major axis of the space. Each manual division is placed in a freestanding casework on either side of the detached, reversed console. The independent pedal stops are split between the two divisions. This design allows efficient layout of the pipework while simultaneously granting the organist easy visual communication with other musicians and all activity in the sanctuary. Perhaps most importantly, the layout results in an instrument that needs a relatively modest amount of space to function well and easily, leaving room for the choir and other instrumentalists in the thriving music ministry. The specification is created with an ear towards work in hymn leading and choral accompaniment, and with an eye for economy in design wherever possible. Notable features include the presence of copious foundation tone, including a full-length 16' open stop. In addition, an upper manual string chorus, the generous number of couplers and Pedal transmissions, and the placement of the 16' Pedal Fagotto under expression will combine to make an instrument of unique potential in the church service. The key action is fully mechanical. The electric stop action has a full complement of pistons and a sequencer. Installation was completed Fall 2011.